The wind whipped about her, practically making the decision to jump for her. Kirina sighed softly to herself has she remembered her last journey here. Waddell had been excited to leave their new realm Tichondrius for a different one…Whisperwind?…. They had stood here at the edge together, hand-in-hand, looking into the abyss below. “Ready, love?” Waddell had asked her. She had nodded, but, sadly, she remembered. When they jumped the first time to be in Tichondrius, they had run off the cliff together, laughing, and ended up in Orgrimmar as if nothing had happened. But for this time, Waddell had explained, they would not be who they were now on this other realm. They may have no memory of their former selves as a Blood Elf, or a Tauren, and, as a result, they would have to find each other again. Any memories of their love or life together would be erased too, but Kirina could not help but feel that, maybe, they would not find each other again, or would want to; who’s to say that they would have the same emotions as different people. When they jumped off the edge, Waddell was laughing, and his hand slowing dematerialized from hers, as he exited the world. Kirina shouted for him. He was gone, but she continued to fall down the abyss. Something was keeping her in Tichondrius….she could not go with him. Kirina eventually saw what had kept her here. She could not let go of her childhood memories, her family’s little farm-house in Eversong Woods (it would not exist on Whisperwind), and, most of all, she could not let go of Waddell. Not having her memories, and a possibility of not having Waddell, kept her spiraling down to the inevitable end of her jump. But it was all different now. She needed to jump. Here she was alone, on Tichondrius, without Waddell anyway. She would rather have a chance to be with him, and, if she got to Whisperwind and did not have any memory of their love, at least it would be better than knowing she was not with him at all…like how hellish it has been for her since having him gone. Kirina closed her eyes, she was ready now. It was time. The slowing effect of an earth-bind totem consumed her fall forward off the cliff, and, as she fell to her knees at the edge, she turned to see who had shouted at her. It was Waddell, laughing, with his arms stretched out for her. She cried happily while pressed against his chest. “Sorry I couldn’t go with you,” she said. The couple hearthed to Orgrimmar together; there would never be a need to come to that cliff again. But not anymore! I’m finally back! If you have not already experience it, I added a new feature to all the pictures in the articles. Once click on a picture, you can scroll through all the pictures on that page. I think it’s pretty neat, and works great for browsing through the Hallow’s End Costume Contest entries. I also went back and updated the Fishing, Cooking, and Workman articles with new items from Cataclsym quests. And I just added a new article under the Spirit of Azeroth collection: Dalaran City Outfits! Cataclysm has really thrown me for a loop, and it will take some time to go through what items are still in-game, and those that have been changed/deleted. Last month, I was going through Merlaina’s gear saved in her bank, and noticed some of my favorite pieces that I went back to get for her, have thus changed since the expansion. 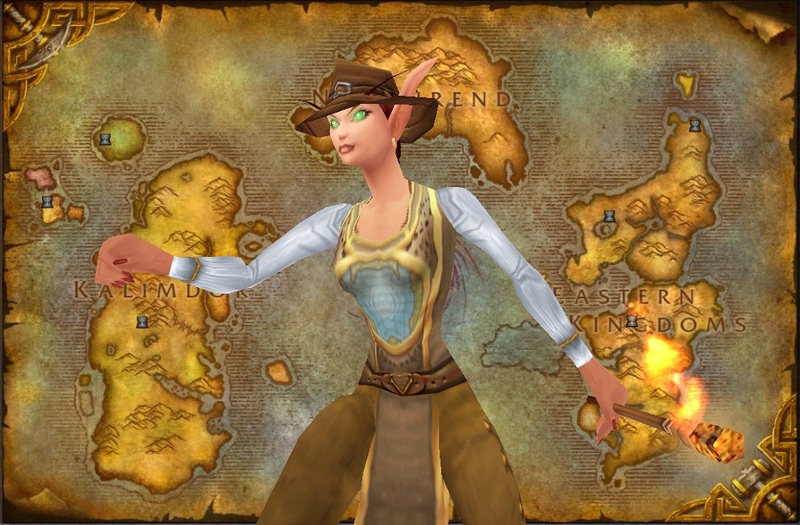 Items like, the once unique purple “swashbuckler shirt-like” Mordant’s Travel Tunic (now a typical Cataclysm style tunic), and the once purple floppy hat, the Wanderer’s Cover (now a…head-brace…of sorts), have been changed forever, along with most of the starting levels quest rewards for all races. They even changed the look of the Raptorhide Legguards, the most coveted pants for a Ironforge Mountaineer outfit….gone. I do not understand why they would go and change such classics. I just deleted those Cata-merized items from Merlaina’s inventory. What is the point of keeping them now? They are not anything special. And, I really do not know this for sure (if you do, please let me know), but I fear the classic dungeon gear (Tier 0) is gone from the game, as well (which kills any classic class RP outfits…because those armor pieces were not class specific). I know that the dungeon boss in Stratholme that dropped all the leg armor from each of these classic sets, Baron Rivendare, has been removed and replaced with Lord Aurius Rivendare. This new NPC has the same loot table, except for all the leg armor. So, why would they remove just the leg armor from these sets?…the other pieces are still listed on Wowhead as random drops from whatever dungeons. But then, I read at some places that say the entire sets have been removed…so why are the dungeons still there; I mean, what would be the point in running them? In my opinion, there is no real incentive to go back to them. I used pieces from some of these sets in my new Dalaran City Outfits article, so, just a heads up…if you see something you like, you may not be able to get quite that look and will have to use alternatives to those Tier 0 pieces that were used 🙁 . I’ll be taking a short break. I had warned before about not being able to play the game/update this website around this time due to my finals. On top of the regular end-of-the semester load, I will also need to take and pass my chemistry teaching exam, and the teaching theory one as well, to be eligible to student teach in the spring and next fall, and thus, finish my degree (freaking finally!! ^_^). I hope all of you have fun playing tomorrow! I know a lot of ya’ll have been waiting for this to come out for a while. Archeology looks like it’s going to be fun to level up. Don’t go to the articles yet, lol! If you haven’t noticed from viewing the Kalimdor article, I did build the outfits and take the pictures through WoW Model Viewer. However, let it be noted that I used only the armor/accessories that I have spread out through my various characters (believe me, I have lists ^_^ ). I have a guild bank full of stuff back on Lightninghoof that Merlaina may or may not be able to wear just yet, but, if Kirina was on that server, she would have posed in it. And, while I used this way to consolidate all what I have so I’m not limited to just what I have on one character, I also used this method to incorporate more races/genders in my articles. Obviously, I can not create a character for each race/gender and level them to 80…I barely have time for Kirina any more, and I thought WoW Model viewer would be the easiest way to accomplish this goal. I do have some concerns by doing this, however. Kamalia had mentioned in a previous comment of hers that a “photo-shopped” screen-shot just wouldn’t be the same. I have to say I agree with her, and part of me feels that I am not being true to the Kirina’s Closet….that is, Kirina’s outfits….by doing so. So, my question to you all is this: are you comfortable with this new approach? Granted, not all of my outfits henceforth would be presented this way, just only when I feel the article could benefit from using other races/genders. Or will my using of WoW Model viewer shatter what you’ve come to know and love about this site? Please know that, while I do this website for myself and to showcase Kirina, I do want to appeal to everyone and inspire them with outfits that could match their characters’ personas and styles. And, just a couple of general comments about The Shattering that took place. I’m sorry that I QQ’d in a previous post about losing the classic world. I realized, by going back through all the articles in my site, that I do have a lot of screen-shots of the classic world behind a lot of my outfits that I have written about. So, that sad phase has since past. I’ve noticed that WoWhead has been adding more and more old-world items each day to their site (they scared me there for a while), like, world-vedor items like the Mystic Sarong and the Wiseman’s Belt are still in-game, just possibly sold by different NPCs, and other “rare mob” drops, like the Ruffian Belt, either still drop from the same mob, or from a different one (many of the regular green items drop from different mobs too, but are still around). I do, however, have concerns for the Formal Dangui. Wowhead doesn’t list it to be bought anymore, the same with the Red Traditional Hanbok. 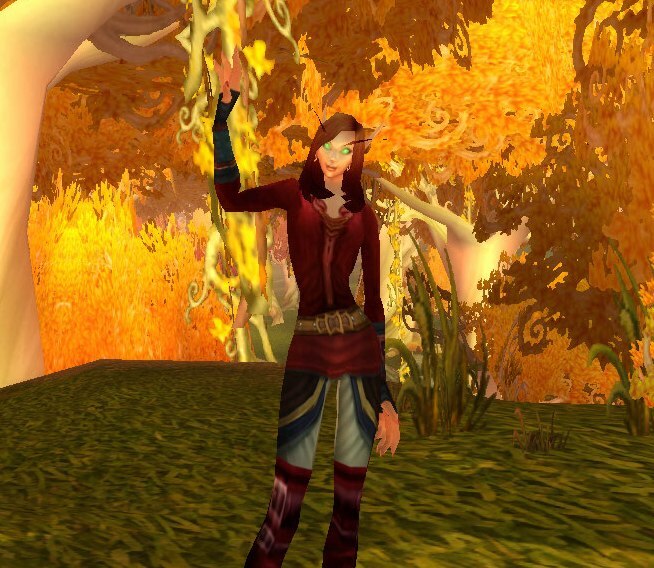 Both robes were rare buys from Geenia Sunshadow in Moonglade, who is still there. Maybe because the rarity of these robes caused them not to show up on her loot-table since The Shattering? I do hope that they are still in-game. It would be a damn shame to loose them. So, according to WoWhead’s website change, and it’s Tuesday (maintenance day), I can only conclude that the screenshots I had left to take of some of the Eastern Kingdoms (in their classic, original state) is passé due to the fact Cataclysm exploded Azeroth. /Sigh. If you haven’t noticed, I added a new section under Fashion entitled “Spirit of Azeroth”. I have finished my Kalimdor sets (still writing up the article), but, I was also in the process of putting together the Eastern Kingdom article too. How am I supposed to pose around a big crater in Westfall? Or, take a screenshot of a not-so-flooded Wetlands. ;( Good thing I got a pictures of the Park in Stormwind before it was obliterated, but, writing about an outfit for it now seems kind of pointless. I feel as though I have let this site down by not working faster. I really wish that I had written these articles “on time” so that it was out for you all to see and enjoy before the world changed forever. There’s no sense crying over spilled milk now, but, it still really hurts me, and I’m sorry. I kind of wish Blizzard had waited, what…a week and a couple of days?…to do this, but whatever. What’s left of these two articles should be up tomorrow, when I don’t have class, or much of anything to worry about. But still….GRRRRR!!! !